Oak flooring gives the space a rustic feel. 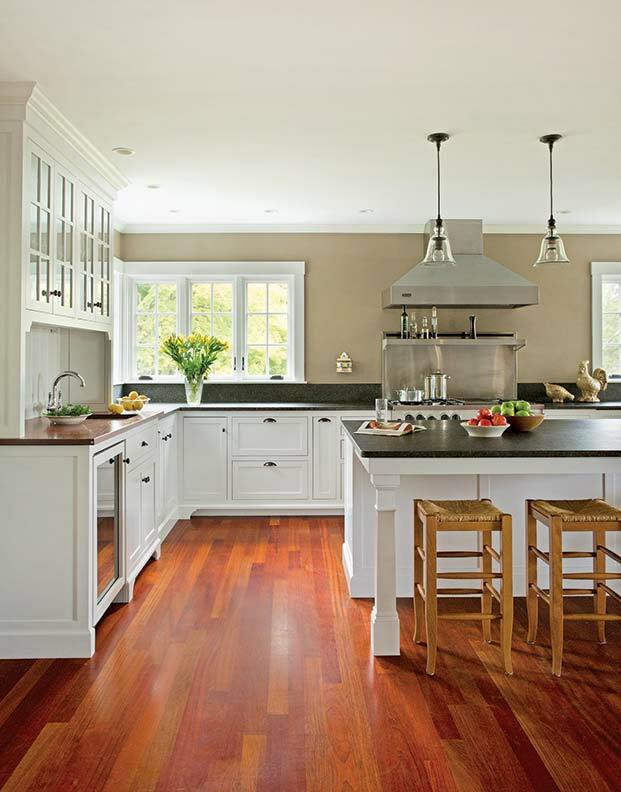 A butcher block surface on the island offers the perfect workspace. 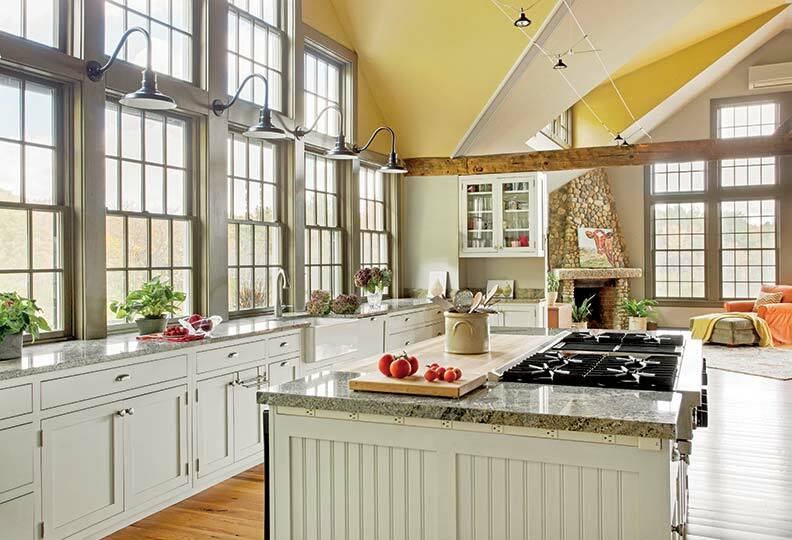 For Tom Tanner and Joan-Ellen Pichard, when the sun shines through a pyramid of eight-over-eight windows and soaks every inch of their kitchen in light, it reveals a dream come true. “I frequently tell Tom that I never imagined I would live in a place so magnificent, so comfortable—and mine,” says Pichard. That sunlight also illuminates the result of more than a decade of hard work. During the roughly 45 years he had lived in Weston, Massachusetts, Tanner’s eyes were drawn to a massive barn emerging from an embankment along a curvy, scenic road that links into the Boston suburb’s downtown. Tanner wasn’t the only one captivated by the barn—in fact, he says, Polaroid used to snap pictures of the structure during color film tests. While descendants of the family that first built the barn in 1847 still owned the building, Tanner vowed to buy it if it ever came up for sale. In 1998, after he saw a “for sale” sign on the property, he kept his word. 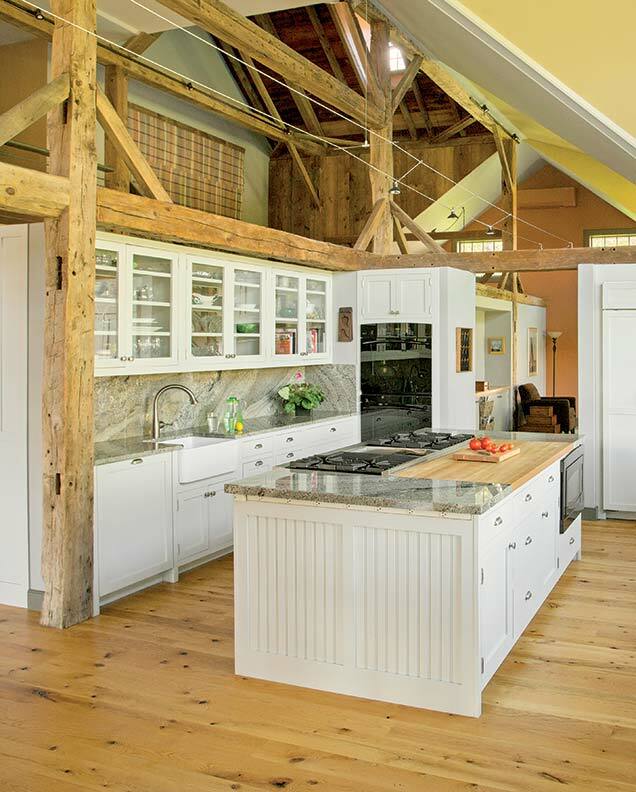 By 2010, the home—which measures approximately 16,000 square feet spread across three floors and exists within the barn’s original footprint—wasn’t finished, but it was watertight and suitable for a holiday feast. “We had almost 40 people here for Thanksgiving, right on the subfloor with rental tables. That was rather fun,” he says. “We actually have a poster signed by all the people that came, with pictures of the barn in various states of disrepair.” To cook the meal, Tanner and Pichard created a makeshift kitchen with an oven, sink, and other appliances that Tanner had accumulated on the job. 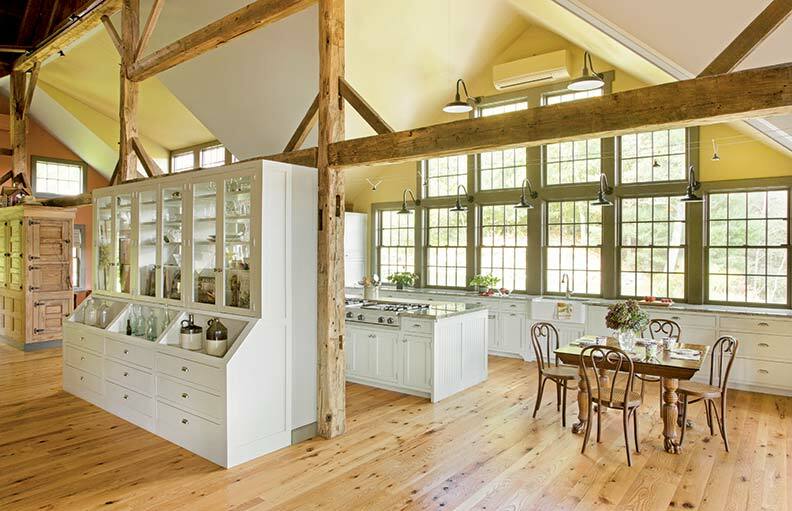 A large hutch divides the massive kitchen. Today, two years after the couple moved in for good, the kitchen has come to fruition. 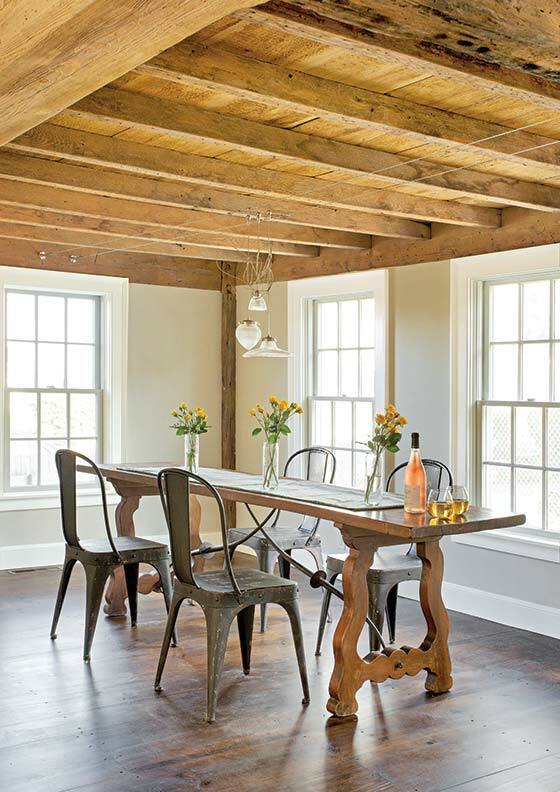 Exposed beams—re-mortised supports from the barn’s original hayloft—cut through 16&apos;-high ceilings. 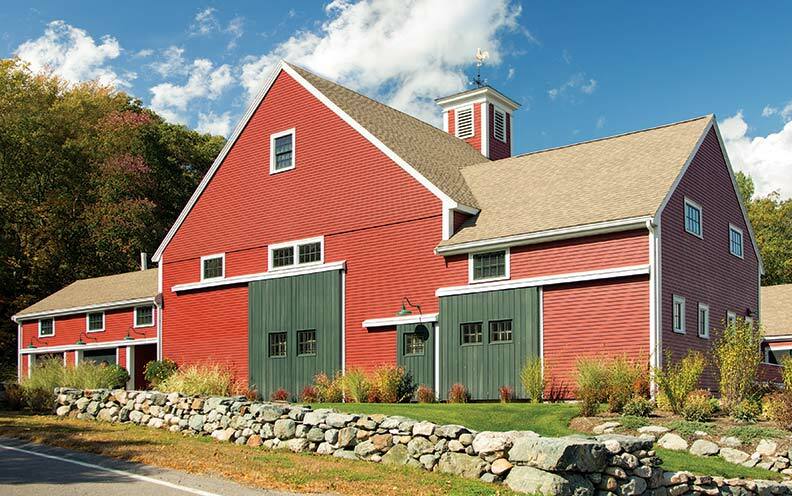 Seven traditional barn light fixtures from Barn Light Electric are arrayed around the section of eight-over-eight windows as wide as the countertop, which was constructed from granite from Cumar Marble and Granite in Everett, Massachusetts. A cooking island is outfitted with a six-burner Viking commercial stovetop, a butcher-block top, and a built-in microwave cabinet, among other features. The state-of-the-art appliances include a Sub-Zero refrigerator, a pair of dishwashers, and two farmhouse sinks. 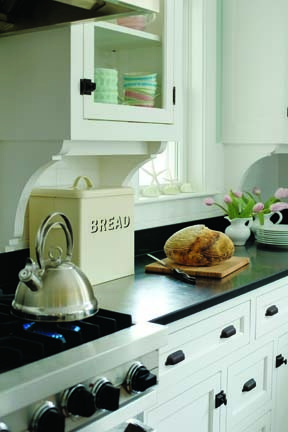 Throughout the kitchen, inset cabinets from Crown Point Cabinetry—custom-made from maple with beadboard end panels, finished with Old Fashioned Milk Paint in Oyster White—are highlights of the space. Because the windows take up virtually an entire wall, many of the cabinets below the countertop are purpose-built to hold dishes, glasses, and other items normally suited to upper cabinets. A blind corner next to the refrigerator was transformed into a useful storage space with a Magic Corner, an easy-access pullout design from the German architectural hardware company Hafele. A Viking range top is set into the granite island. The only upper cabinets in the kitchen are on a hutch that divides the space from the 12&apos; x 24&apos; entranceway. To carry light from the windows to the entrance, the hutch cabinets have glass doors and open shelving. And while the side facing the entrance looks like a traditional hutch, the side within the kitchen is outfitted with a sink, granite backsplash, and granite countertop. The oak floors came from Vonderosa Wide Plank Flooring of New Hampshire. Underneath all of the floors throughout the home’s living space, Tanner laid two miles of half-inch plastic pipe to emit radiant heat supplied by Buderus wall-hung boilers. Additionally, all of the casings, baseboards, and millwork were handmade, following a flat pattern with an ogee at the edge.